Teens Cleanse ‘Haunted’ Hospital with Fire! A derelict, abandoned hospital in Riyadh, Saudi Arabia has attracted hundreds of rookie ghost hunters for years. 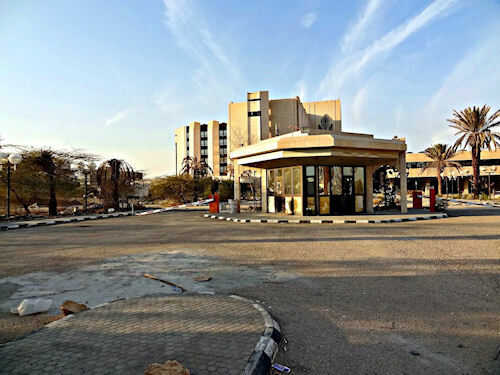 Riyadh’s Iraq Hospital, a now abandoned building which treated Gulf War soldiers beginning in 1991 has become the focal point of young ghost hunters determined to rid the site of malevolent Jinn. According to the Koran and Arabian mythology, Jinn are spectral beings that supposedly tempt people into doing the wrong thing. Recently, via text messages, dozens of teen ghost hunters broke into the hospital causing massive damage to left-behind facilities before setting it ablaze in order to remove what they believed to be Jinns living within the building. Local press complained about the unsafe condition of the building. The Healthy Ministry simply shrugged and replied that the building is on private property, cannot function as a working hospital and that it’s basically not their responsibility. Meanwhile YouTube videos continue to surface showing young ghost hunters exploring the eerie location looking for evidence of the Jinn. Posted in Djinns, Ghost Hunting | Comments Off on Teens Cleanse ‘Haunted’ Hospital with Fire! Several people said to be close to the president and his chief of staff, Esfandiar Rahim Mashaei, have been arrested in recent days and charged with being “magicians” and invoking djinns (spirits). Ayandeh, an Iranian news website, described one of the arrested men, Abbas Ghaffari, as “a man with special skills in metaphysics and connections with the unknown worlds”. No, but seriously Supreme Leader, was this your card? You are currently browsing the archives for the Djinns category.